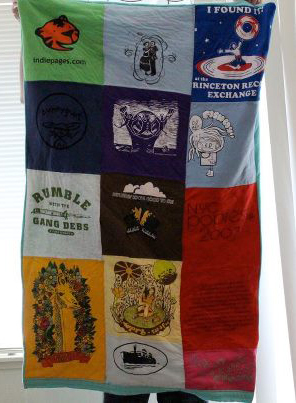 Kudos to Courntey Bennett for making an amazing indiepop quilt! If you look close you might spy a Tullycraft ‘Rumble with the Gang Debs’ t-shirt. So awesome! Entry filed under: Sew Awesome!. One of the first Fishboy shirts on the upper right and a Poison Control Center shirt in the lower left!